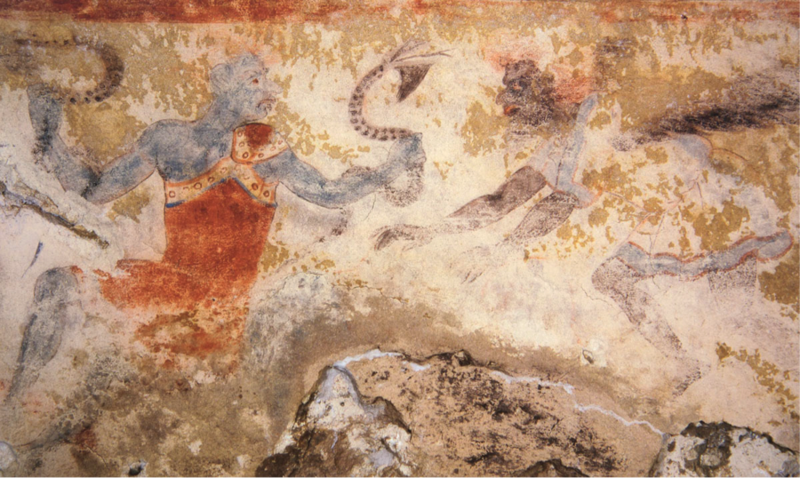 During this discussion, two different students mentioned that the blue skin reminded them of demons and religious figures found in other cultures. I never thought too deeply about how blue skin appears in different cultures across the world, and I thought I’d make a little compilation of a few noteworthy examples. 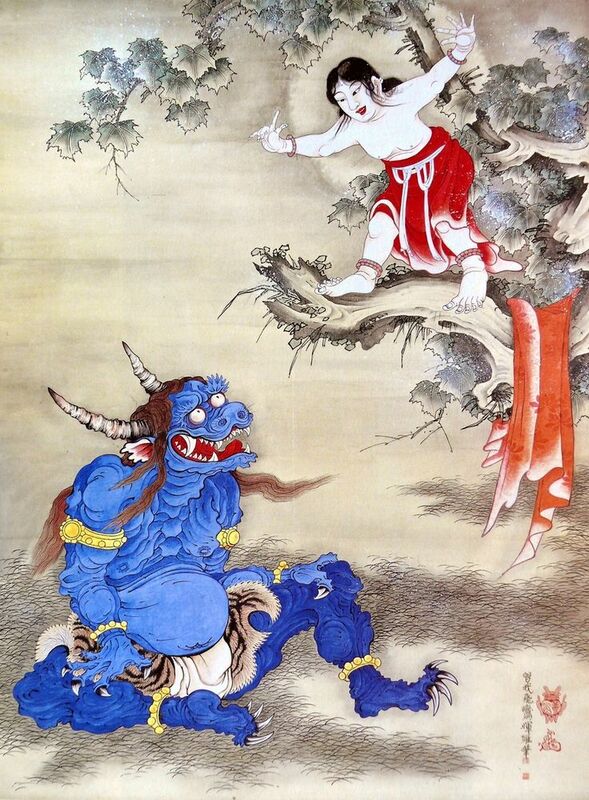 Soga Shôhaku, (1730-1781), Sessen Doji (Sessendoujizu) scene with a blue oni, detail from a hanging scroll. Ink on silk, about 1770s, Keishouji Temple. The oni is an ogre or troll, and it is a common figure in Japanese folklore. They have distinctive long horns, which makes them appear to be a combination of both beasts and humans. Onis most commonly appear with blue, red or green skin, and they are often clad in tiger skin. One particular representation of the oni that I like is from the 18th century (shown above), in a painting by Soga Shôhaku. 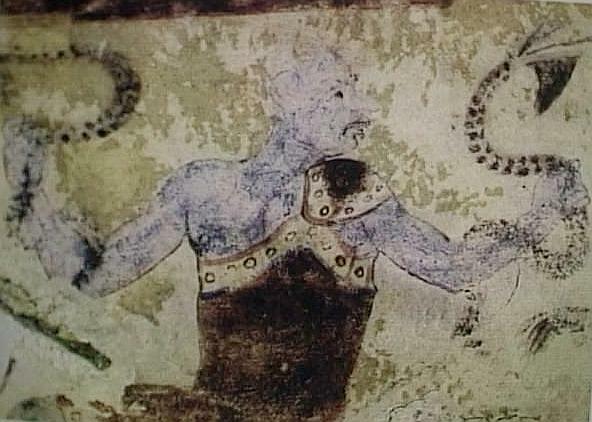 Here, an oni is used to depict a demon from the Sessen Doji tale. In thinking about the various colors which can be used for the oni’s skin, I wonder if color is supposed to suggest that the figure is inhuman. From what I can tell, the color of the skin doesn’t matter (since red, blue, and green are all used), but all of the colors are very different from how human skin actually appears. To me, the blue skin of the no suggests that the figure is otherworldly, which by extension makes the figure seem more threatening to me. The creators of the film Avatar used blue skin for the same reason; they played with modern associations regarding skin color and race to make sure that moviegoers could perceive these figures not only as aliens, but as Others. 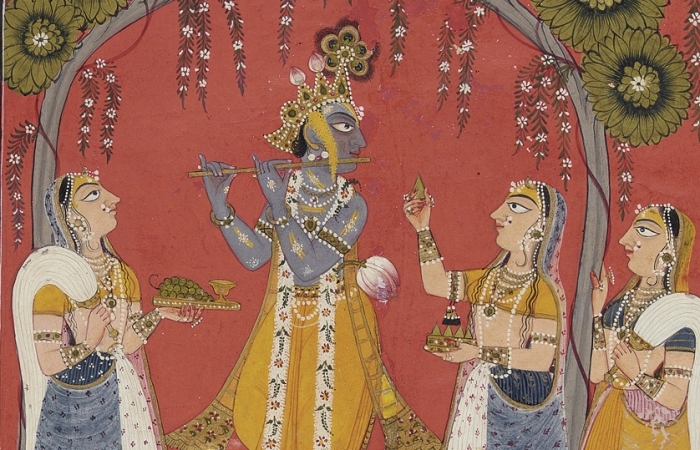 Krishna Fluting for the Gopis, page from an illustrated Dashavatara series, ca. 1730. Opaque watercolor and gold on paper, 10 1/4 x 8 in. In some cases, though, the color blue has much more significance than to draw a visual distinction of difference between a the figure-in-question and a human audience. Such is the case with Hindu art, in which more than one blue-skinned figure appears. 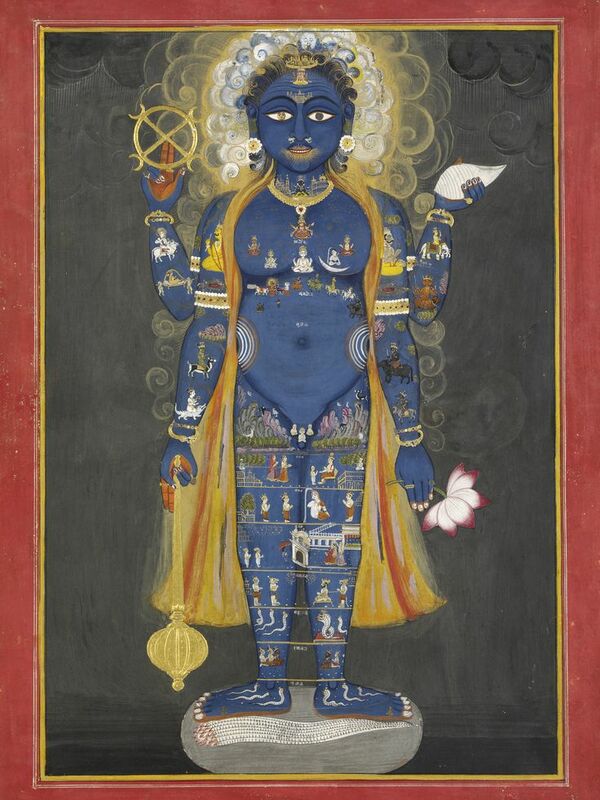 Perhaps the most common figure who can appear with blue skin is Vishnu (who can also appear with blue skin as Krishna, considered by many to be an avatar of Vishnu). Some claim that the blue skin in this religious context has positive connotations, suggesting the sky and the limitlessness of the sky and universe. Blue also references life and the forces of life, since bodies of water can appear blue. Finally, others assert that the color blue in Hinduism is used to describe manliness, bravery, a stable mind and a depth of character. How curious that the color blue can suggest a depth of character in Hinduism, whereas the blue color in Japanese folklore seems to suggest an inhuman creature (which perhaps implies a lack of character or positive human feeling, right?)! I know of a few other instances where blue-skinned figures appear, too. 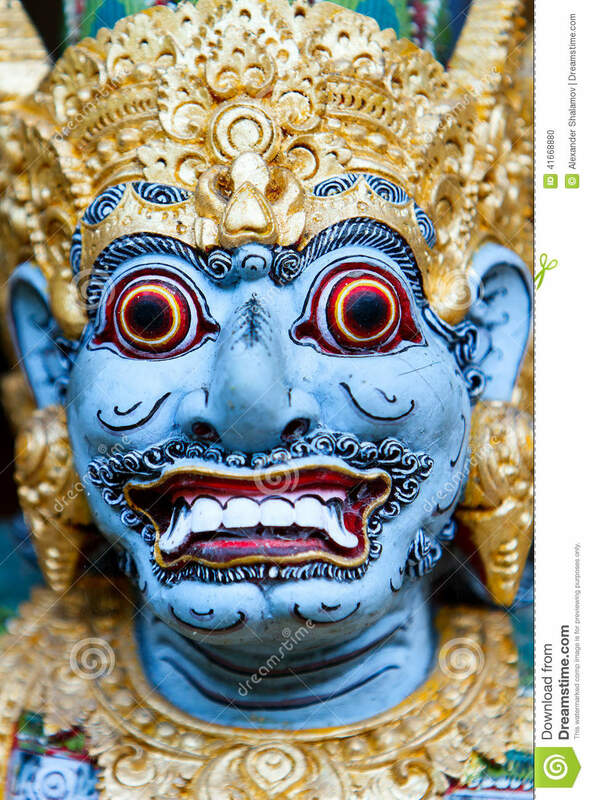 In Balinese culture the traditional gods can appear with blue skin. A traditional Balinese monster, the oguh-oguh, also can appear with blue skin (although various colors are used to depict the oguh-oguh, so the color doesn’t seem to be a qualifying feature). Do you know of other cultural instances in which blue-skinned figures occur in art? If you know of other cultural and/or symbolic associations with blue skin too, please share! 2 Kristin Lee Hostetler, “Serpent Iconography,” in Etruscan Studies 10, no. 16 (2007): 203. 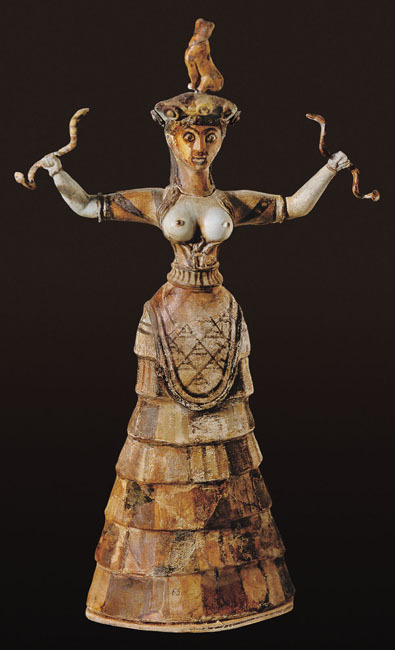 I can’t even express how much I love the Minoan Snake Goddess (shown left, c. 1700-1550 BCE, image courtesy Flickr via Xosé Castro). 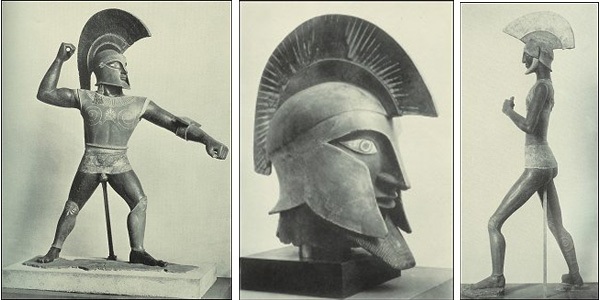 This was one of the first statues that I loved as an AP art history student in high school. 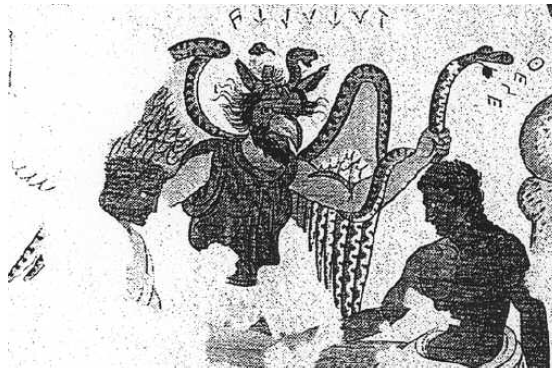 A few weeks ago, my students and I discussed how the snake could have held multiple symbolic associations for the Minoans. Snakes are associated with rejuvenation in many ancient Mediterranean cultures, since snakes can rejuvenate themselves by shedding their skin. Snakes are also associated with resurrection, since they can move both above and beneath the ground. 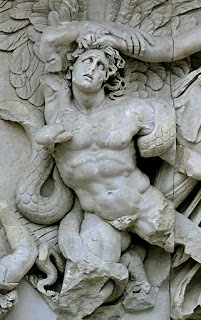 Last week, when discussing Hellenistic art, a student asked why Alkyoneos (depicted in part of the Gigantomachy frieze at the Altar of Zeus, Pergamon, c. 175-150 BCE) was entwined with a snake. 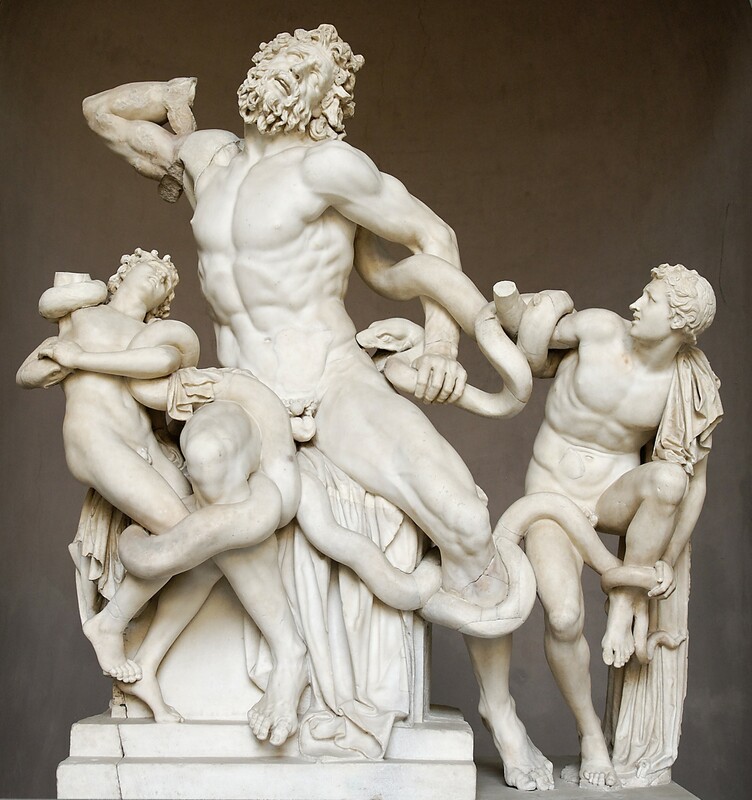 (We were also looking at another Hellenistic sculpture, the Laocoön (1st century BC), and the student noticed a visual similarity between the writhing snakes.) 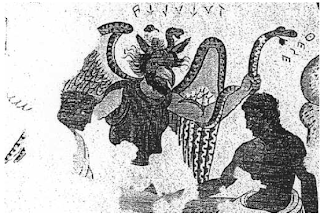 I had never paid attention to the Alkyoneos snake before, but discovered that the snake helps the viewer to identify that Alkyoneos is battling with the Olympian goddess Athena. 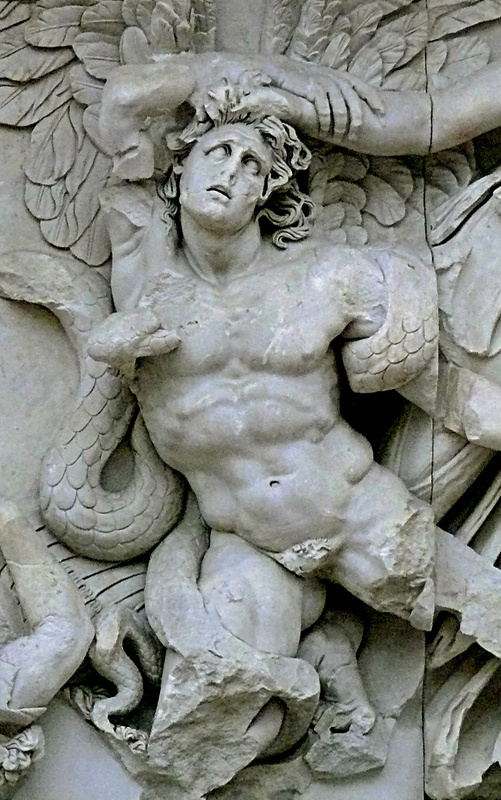 The snake aids Athena in her victory, similar to how serpents aid the Olympian gods (specifically Athena, according to some accounts) in the killing of Laocoön, the Trojan priest. Athena was often identified with snakes (I joked with my students that she might have been a Parselmouth). Not only was the snake associated with wisdom (which was one of Athena’s attributes), but snake also served as the symbol for Erectheus, the mythical king of Athens. 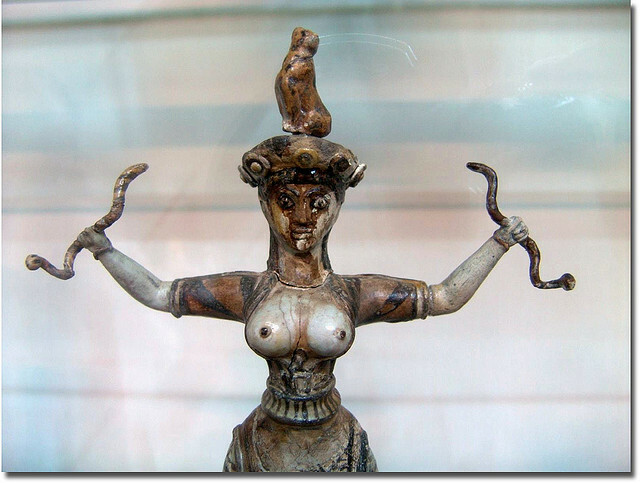 As the patron goddess of Athens, it makes sense that Athena would also be associated Erectheus (and Athens) through the snake symbol. Athena was depicted with a snake in the monumental “Athena Parthenos” statue by Phidias (original dated 438 BC, see reconstruction from Royal Ontario Museum here). Earlier in the quarter, my students and I have discussed the significance of the enraged uraeus snake in Egyptian pharaonic imagery (as can be seen in the funerary mask of King Tutankhamun, c. 1327 BCE). The snake is a reference to the Wadjet, the cobra goddess of Lower Egypt. According to mythology, the pharaoh sat at coronation to receive his crown from this goddess.3 The cobra was one of the earliest of Egyptian royal insignia. Do you have a favorite work of art which includes snake imagery? It’s interesting that snakes have obviously fascinated (and intimidated) the human race for so many centuries. I can think of many other examples, even extending outside the realm of ancient art. Biblical images of Eve with snakes have been popular in Christian art for centuries. 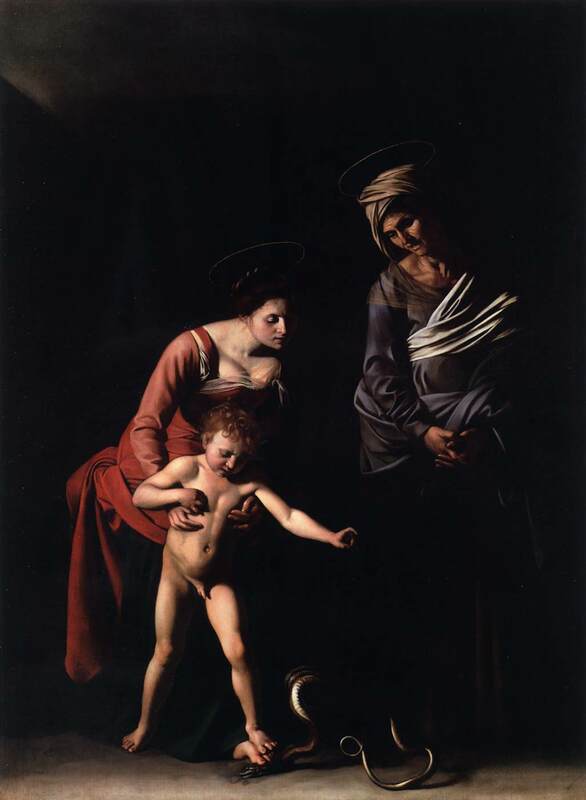 Snakes can also appear in conjunction with the Virgin; my favorite Baroque example is Caravaggio’s Madonna with the Serpent (1606 CE). 1 Kristin Lee Hostetler, “Serpent Iconography,” in Etruscan Studies 10, no. 16 (2007): 203. 3 Nancy Luomala, “Matrilineal Reinterpretation of some Egyptian Sacred Cows,” in Feminism and Art History: Questioning the Litany by Norma Broude and Mary D. Garrard, eds. (Boulder, CO: Westview Press, 1982), 27. The Capitoline Wolf is Medieval?!? I don’t know how I missed this news (it’s over two years old), but I thought that I would post it for others who may not have heard. 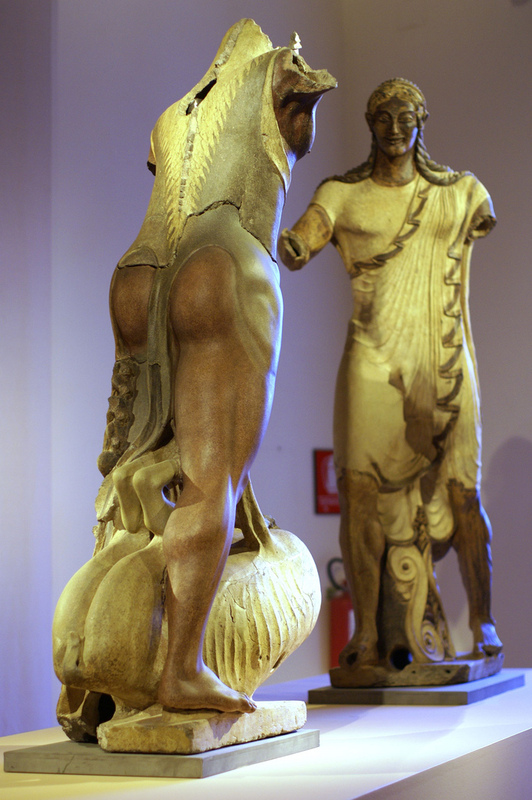 In recent years scholars have questioned whether the “Capitoline Wolf” (an iconic statue of a she-wolf that is related to the mythological founding of Rome, see left) is Etruscan. 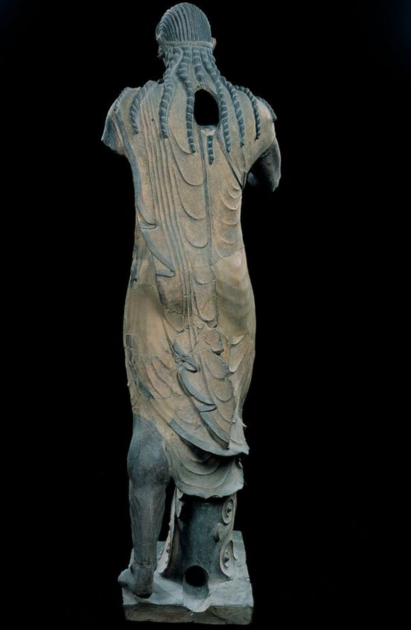 Winckelmann first attributed this statue to the Etruscan period; he based his reasoning on the way that the wolf’s fur is depicted. 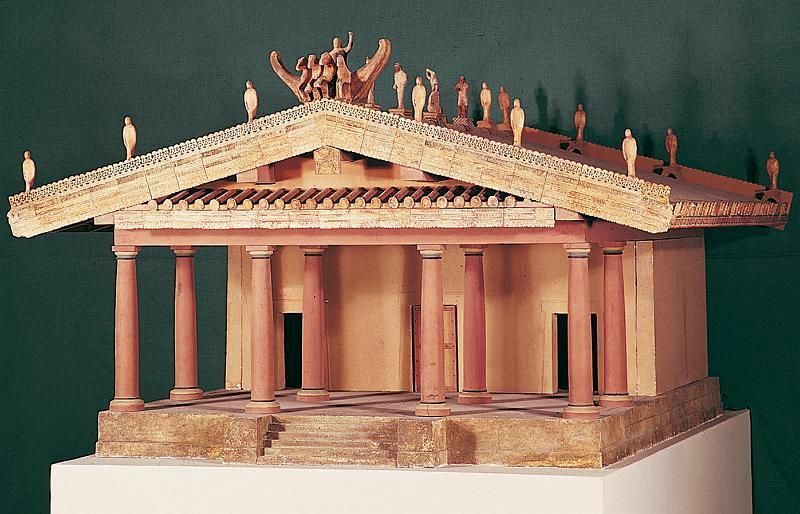 In turn, it generally became accepted that the statue was created in the 5th century BC. However, a couple of scholars have questioned this attribution since the 19th century. The most recent critique was published by art historian Anna Maria Carruba in 2006. Carruba noted that in the 1997 restoration of the statue, it was observed that the she-wolf was cast as a single unit – a technique that was common during the medieval period. Carruba’s work eventually led to radio-carbon dating tests on the sculpture. About twenty dating tests were conducted at the University of Salermo, which resulted in the announcement that the she-wolf was created in the 13th century AD! In other words, she was created up to 1,700 years later than we originally thought. Wow. Sorry Winckelmann: it looks like you’ve struck out again. Ouch. This is a crazy paradigm shift for me. I’ve always connected the Capitoline Wolf with the Etruscans (and the Romans by extension, since she is connected with the story of how Rome was founded). 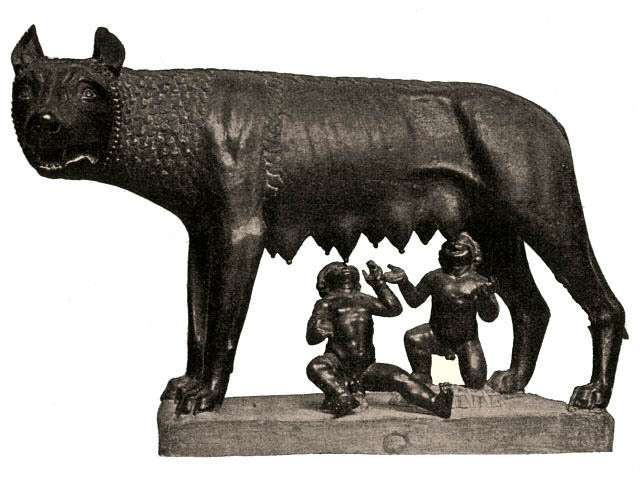 I’ve always known that the Romulus and Remus figures underneath were made during the Renaissance (they were fashioned in the late 15th century AD, probably by Antonio Pollaiolo), but it’s crazy to think that the Capitoline Wolf is medieval. Is this news for anyone else? Maybe I’m just behind the times. What do other people think about this new date? 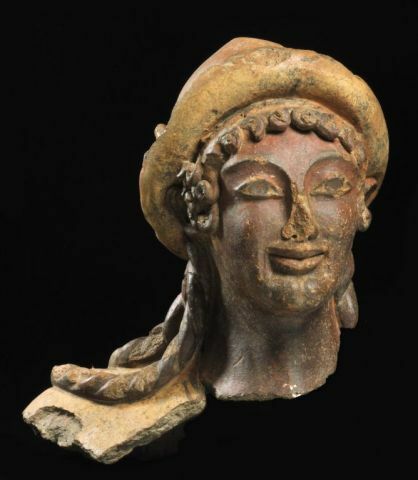 I don’t mind the hippie comparison, especially if it can help students to differentiate between the Minoan and Mycenaean civilizations. I do think it’s important, though, for students to know that the comparison isn’t perfect. 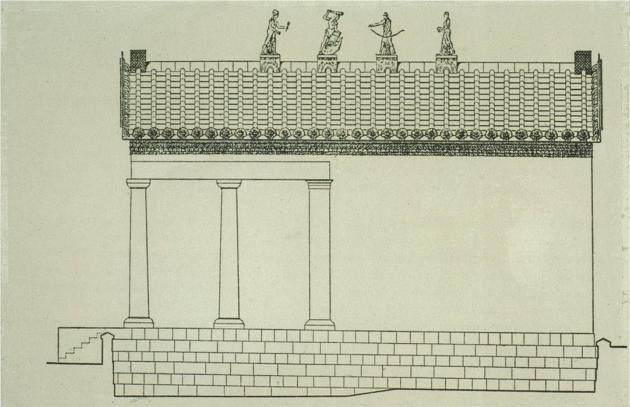 For example, the fact that the Minoans had fortifications (despite what Sir Arthur Evans argued) and were possibly involved in human sacrifices suggest that these people weren’t all about love and peace. Speaking of Minoans and the Spring Fresco, I was struck today about how there are some similarities between this painting and a tomb painting from the Etruscan period (“Boys Climbing Ricks and Diving,” from Tomb of Hunting and Fishing in Tarquinia, late 6th century BC, shown right). Both paintings depict brightly colored hills (with the mounds divided into multiple colors). 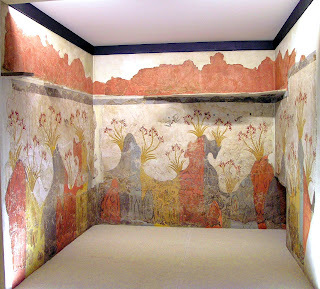 In both cases, the hills are adorned with spindly vegetation (the Spring Fresco depicts stylized lilies, but I don’t think there is enough detail to identify the Etruscan plant). 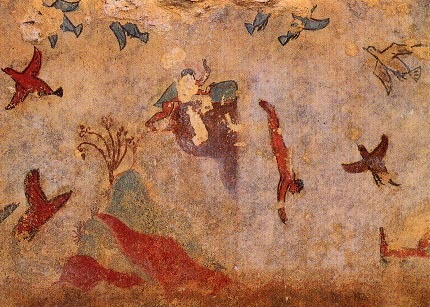 Additionally, the two paintings have birds darting about in the air. I know that over 1,000 years separate these frescoes (not to mention that they are from different geographic areas – the Minoans were on islands in the Aegean Sea and the Etruscans were on mainland Italy), but I think the similarities are interesting. 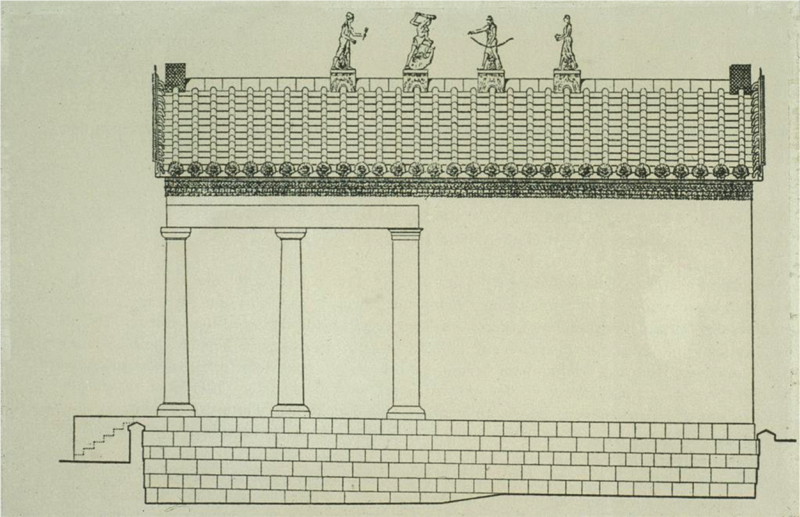 1 Mary Beard, “Knossos: Fakes, Facts, and Mystery,” in The New York Review of Books (August 13, 2009). Available online here. 2 However, I only make the psychedelic comparison with students as a joke. It has been noted that the bright colors of the rocks are actually quite naturalistic. “The colors may seem fanciful to us, but sailors today who know the area well attest to their accuracy, suggesting that these artists recorded the actual color of Thera’s wet rocks in the sunshine, a zestful celebration of the natural world.” See Stokstad, Art History, 4th ed. (Upper Saddle River, New Jersey: Prentice Hall, 2011), 92.